Plantar fasciitis is the most common cause of heel pain in adults and afflicts approximately 2 million patients per year. The classic symptom of plantar fasciitis is heel pain that typically is worst with the first several steps in the morning and lessens as the day continues. Individuals often have pain at the beginning of an activity that diminishes or resolves as they warm up. 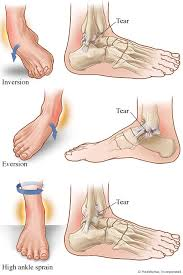 General symptoms recur after the activity and frequently the pain is described as a deep ache or tenderness at the inside front area of their heel. The pain can be accompanied by stiffness, sharp shooting pain, localized inflammation, and often becomes most intense at the end of the day. The plantar fascia is a long, thin ligament that lies directly beneath the skin on the bottom of your foot. It connects the heel to the front, and supports the arch of your foot. The plantar fascia is designed to absorb the high stresses and strains we place on our feet. Sometimes, too much pressure damages or tears the tissues. The body’s natural response to injury is inflammation, which results in the heel pain and stiffness. Over time, bone spurs in the heal can form. Although many people with plantar fasciitis have heel spurs, spurs are not the cause of plantar fasciitis pain. One out of 10 people has heel spurs, but only 1 out of 20 people (5%) with heel spurs has foot pain. 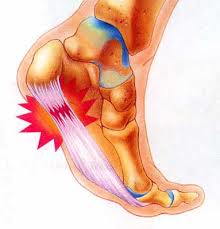 Because the spur is not the cause of plantar fasciitis, the pain can often be treated without removing the spur. The simplest definition of turf toe is a big toe sprain. It happens when the toe is forcibly bent up into hyperextension, such as when pushing off into a sprint and having the toe get stuck flat on the ground. This is the typical position of the foot when a turf toe injury occurs. Common tissues injured include the plantar plate under the metatarsophalangeal joint (MTP), strains to the flexor hallucis longus/brevis muscles/tendons, or injury to the sesamoid bones in the tendons. Injuries are graded from 1 to 3 – mild to severe. Grade 1. The plantar complex has been stretched causing pin-point tenderness and slight swelling. Grade 2. A partial tearing of the plantar complex causes more widespread tenderness, moderate swelling, and bruising. Movement of the toe is limited and painful. Grade 3. The plantar complex is completely torn causing severe tenderness, severe swelling, and bruising. It is difficult and painful to move the big toe. Grade 2 sprain: Partial tearing of the ligament, abnormal looseness (laxity) of the ankle joint. Grade 3 sprain: Complete tear of the ligament. If the examiner pulls or pushes, gross instability occurs. It is very important to get treatment to a sprained ankle to decrease pain, inflammation and prevent lasting effects.